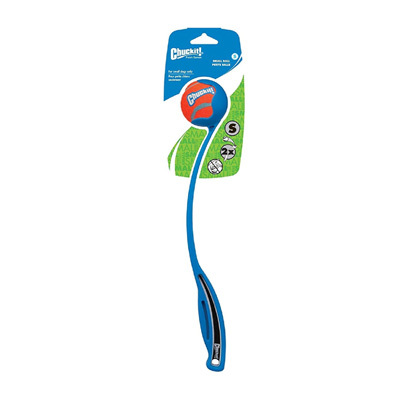 Chuckit Mini is a ball launcher for small dogs. 2" ball compatible. Small dogs have been barking for it and now they have a dog ball thrower just their size. The Mini features a scaled down throwing cup that sends those little balls flying. Enjoy an effortless game of fetch because the Mini does all the work. All play, no slobber, with hands free pick up. For small dogs only. For use with small 2" balls only. 13 inches long. Made of lightweight, durable plastic. The Chuckit Mini Ball Launcher takes small 2" dog balls. Click here for our selection of dog balls. I had looked everywhere for a small ball launcher for our little Yorkie. So was really pleased to at last find one. Delivery was very quick and the product perfect! Superior Service! Delivery was a day earlier than expected, so we made the most of the sunny weather playing 'fetch' with our puppy in the park. The mini sized balls are great for my dog, orange colour makes them easier to find in the field too! It does chuck the ball really far as it says. Try Chuckit Ultra Ball, Chuckit Fetch Ball or Chuckit Max Glow Ball. You won't regret it :-) Don't forget to buy the small 2" balls for a mini launcher.